Great weather, concerts make it one of the best fairs ever. It was more than just fair weather at the 2011 Nebraska State Fair. At its second run at Fonner Park in Grand Island, the fairgoers experienced pleasant, sunny weather throughout the 11-day event. The weather, coupled with a throng of nearly 68,000 that came on Sunday, Sept. 4, resulted in a 2011 attendance total of 333,043 people coming through the gates. That's an 8% increase in attendance over 2010, the first year in Grand Island. Joseph McDermott, State Fair executive director, said the Sept. 4 crowd was the largest in Grand Island in the first two years there and the third largest single-day attendance in the fair's history. 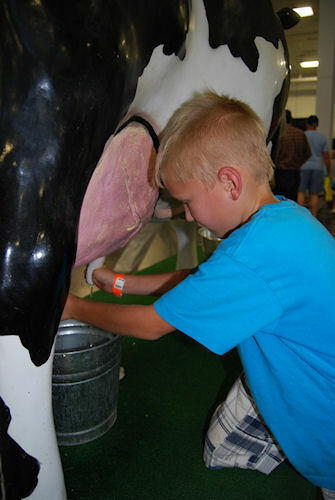 YOUNG DAIRYMAN: This young lad tries his hand at milking the Fiberglass Milking Cow in the fair's Exhibition Building. The sold-out Willie Nelson concert that same day boosted the attendance, according to fair officials.